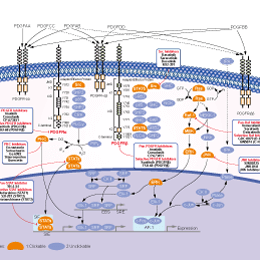 Tyrphostin AG 1296 is an inhibitor of PDGFR with IC50 of 0.3-0.5 μM, no activity to EGFR. After inoculation with KAT4 cells, administration of compounds including MK-2206 (100 mg/kg), tyrphostin AG 1296 (100 mg/kg), or a combination of MK-2206 (100 mg/kg) and tyrphostin AG 1296 (100 mg/kg) was performed. The combination of MK-2206 and tyrphostin AG 1296 induced significant apoptosis of KAT4 tumor cells in vivo measured by the terminal deoxynucleotidyl transferase dUTP nick end labeling assay (green), and nuclei were stained with Hoechst (blue). Onco Targets Ther 2014 7, 425-32. Tyrphostin AG 1296 purchased from Selleck. Membranes are prepared from confluent cultures of Swiss 3T3 cells as described. For measuring receptor autophosphorylation, 10μg membrane protein per assay are incubated for 20 min on ice in the presence of 1.2μg/mL EGF or 2μg/mL PDGF, or both; 50 mM Hepes (pH 7.5); and 3 mM MnCl2 in a volume of 45μl. In order to test the effects of tyrphostins, these are added in a volume of 0.5 μl (in DMSO; final concentration, 0.5%) 15 min before addition of the growth factors. Phosphorylation is initiated by addition of [γ-32P]ATP and terminated after 2 min by addition of 10μL of a solution containing 6% SDS, 30%β-mercatoethanol, 40% glycerol, and 0.5 mg/mL bromophenol blue. The samples are heated for 5 min at 95 ℃ and subjected to SDS-PAGE using 10% acrylamide gels. The gels are stained and dried and subjected to autoradiographic analysis. Kovalenko M, et al. Cancer Res, 1994, 54(23), 6106-6114. Kovalenko M, et al. Biochemistry, 1997, 36(21), 6260-6269. Sunitinib is a multi-targeted RTK inhibitor targeting VEGFR2 (Flk-1) and PDGFRβ with IC50 of 80 nM and 2 nM, and also inhibits c-Kit. Sunitinib Malate is a multi-targeted RTK inhibitor targeting VEGFR2 (Flk-1) and PDGFRβ with IC50 of 80 nM and 2 nM in cell-free assays, and also inhibits c-Kit. CP-673451 is a selective inhibitor of PDGFRα/β with IC50 of 10 nM/1 nM in cell-free assays, exhibits >450-fold selectivity over other angiogenic receptors, has antiangiogenic and antitumor activity. 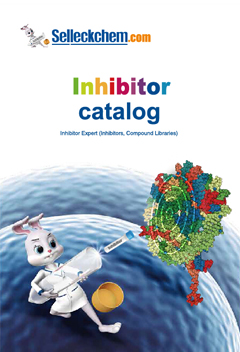 Imatinib (STI571) is a multi-target inhibitor of tyrosine kinase with inhibition for v-Abl, c-Kit and PDGFR, IC50 values are 0.6 μM, 0.1 μM and 0.1 μM in cell-free or cell-based assays, respectively. Crenolanib (CP-868596) is a potent and selective inhibitor of PDGFRα/β with Kd of 2.1 nM/3.2 nM in CHO cells, also potently inhibits FLT3, sensitive to D842V mutation not V561D mutation, >100-fold more selective for PDGFR than c-Kit, VEGFR-2, TIE-2, FGFR-2, EGFR, erbB2, and Src. Sennoside B, a kind of irritant laxative isolated from rhei rhizome, inhibits PDGF-stimulated cell proliferation.